Hartford PNH | Polish National Home of HartfordPolish National Home of Hartford | The Hartford PNH an authentic 1930 Polish Tavern, Restaurant, Banquet Venue. A national historic landmark in downtown Hartford featuring an authentic 1930 Polish Pub & Tavern, the grand Chopin Ballroom and more. The Hartford PNH – Polish National Home of Hartford – has been and continues to be a favorite Connecticut pub, dining and event destination. For Hartford late-night night-life, the Hartford PNH – Polish National Home – is the preferred meet-up spot to enjoy a bite to eat and drinks before grabbing an Uber to the next destination in your night out. Grab a local craft or imported Polish beer, vodka, wine, or any of our seasonal specialty drinks. We are “re-booting” this website. Our Apologies for any broken links as we get it completely redone. New England’s best comics are taking over the Polish National Home of Hartford for an amazing night of comedy, food and drinks. Join us for a night of laughs with some of the top comics in the Northeast while enjoying delicious Polish cuisine. Hartford’s Historic Chopin Ballroom welcomes New England’s premier stage hypnotist and comedian Jim Spinnato. Sit back and relax as he hypnotizes fellow audience members, creating hysterical R-rated situations and provides laughs for all! Our ice cream soda floats, an American classic, is made next level by starting with Connecticut’s own Hosmer Mountain Sodas (orange, root beer, grape) and then expertly spiked with a special vodka. Topped with whipped cream and a cherry, this is The Summertime beverage of choice in Central Connecticut! ✔A new PNH favorite! 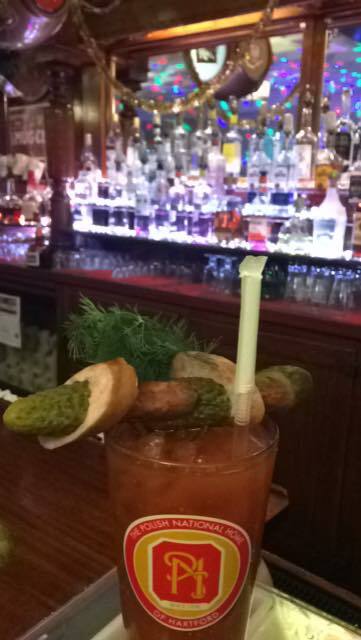 PNH Hussar Bloody Mary – is it a drink or meal?? Coming May 18th New England Doo Wop Society show at our Chopin Ballroom? Come early for our special Doo Wop Buffet! Only $14.95. Purchase the Doo Wop Buffet Dinner Tickets online at DooWopBuffet.ezEvent.com or at the Hartford PNH. Purchase SHOW TICKETS directly from the New England Doo Wop Society by calling Gary @ 413-478-0901 or Bob @ 413-786-1929!